Keelman Homes set to revive more empty homes. A programme to bring 40 empty homes back into use has been so successful that a bid to bring back a further 40 has been given the green light. In April 2015 local housing association Keelman Homes successfully applied to the Homes and Communities Agency (HCA) for the Empty Homes Grant 2015-18, for funding to bring back 20 empty homes across Gateshead. The positive outcome of this resulted in approval for another 20, bringing the total to 40. Under the Empty Homes Purchase and Repair Programme Keelman Homes buys back and refurbishes privately owned properties, then lets them at affordable rents (generally 80% of the market rent), via the Tyne and Wear Homes lettings system. With all of the original 40 homes having been selected (the majority already successfully acquired, refurbished and let to tenants), it was time for Development and Investment Manager Amanda Gallagher and her team to turn their attention to a new programme of work. The plan to bring back another 40 homes is the result of a successful bid to the HCA for the new Shared Ownership and Affordable Homes Programme (SOAHP) 2016-21. 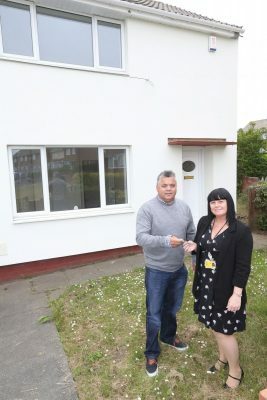 Photo: Keelman Homes – 2 Coverdale, Leam Lane renovations – Development and Investment Manager Amanda Gallagher and New Build and Investment Partnering Manager Jim Charlton at one of Keelman Homes’ refurbished houses from the Empty Homes Programme.